Create the stylish and attractive kitchen you've always wanted with this premium kitchen decorations set. 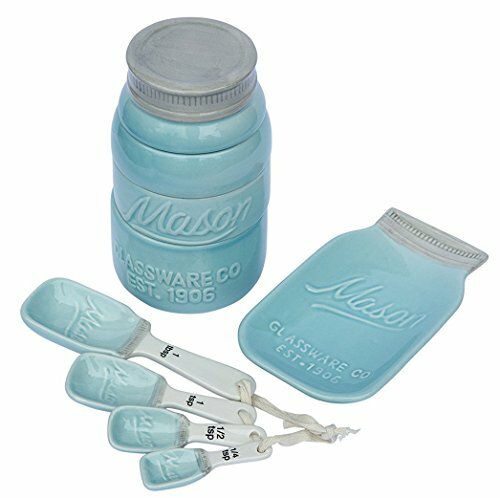 We could go on forever about the good looks of this stylish set: the Vintage Mason Jar Kitchenware Set by Comfify recreates that iconic vintage mason jar style, in a delightful and versatile aqua blue color. It can't be all about looks, functionality is also important. The Vintage Mason Jar Kitchenware Set by Comfify has everything you need to improve the convenience of your kitchen. 4 measuring spoons in ¼ tsp, ½ tsp, 1 tsp and 1 tbsp sizes, 4 measuring cups in sizes ¼ cup, 1/3 cup, ½ cup and 1 cup sizes, and a spoon holder outfit your kitchen to be the comfortable and delicious center of your home! If you have friends or family who like to spend time in the kitchen, this is the easiest and most appreciated gift you'll ever give! The Vintage Mason Jar Kitchenware Set by Comfify is a welcome gift for any occasion, including birthdays, anniversaries, as a wedding gift or housewarming present, Mother's Day gift and more. CLICK NOW TO PURCHASE and make your kitchen more beautiful and more functional! Purchase protection with Amazon's A-to-z Guarantee, and Amazon Prime members receive 2-day shipping ABSOLUTELY FREE!